You can offer calls or chats that have been abandoned as new conversations to agents. 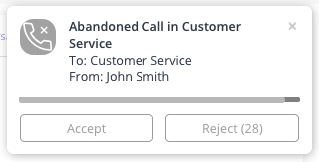 If a customer is calling or chatting and hangs up or ends the chat before reaching an agent, perhaps because of the wait time, you can offer these abandoned conversations to agents so they can follow-up with the customer. You probably won't want to follow-up with every single customer, but rather follow-up with specific customers like your VIP customers. 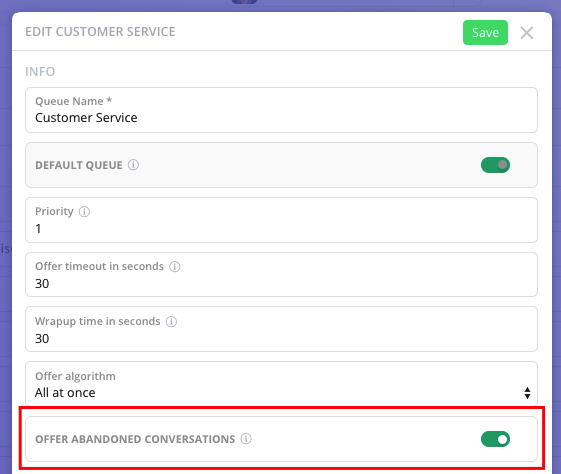 Therefore, you can specify whether you want to offer abandoned conversations for each queue. Also, remember to check under Conversations with customer to see if the customer contacted you again later and got through to an agent.